Depression is a devastating illness and for those who have never experienced it, difficult to understand. 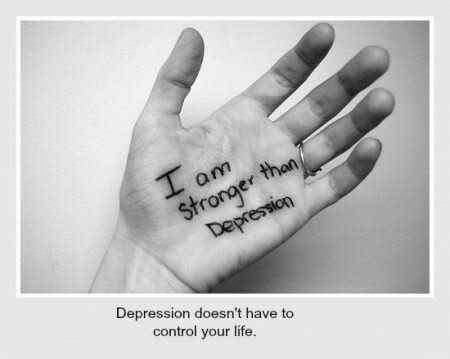 According to the World Health Organization, there are approximately 350 million people living with depression. This does not include those who are undiagnosed due to the stigma of mental illness. Fortunately, there are ways that you can live with depression. call a friend or family member and talk about something aside from the depression. A hobby can work as both a distraction and a long term solution to finding an activity you enjoy. One of the most devastating parts of depression is the loss of things you previously found pleasurable. Just the act of finding a new hobby can help you find the things that still make you happy. Pick one thing a day and make sure you get it done even if you do not feel like doing it. The feeling of accomplishment helps to alleviate the depression and you actually get things done. One of the worst issues with depression is lack of motivation. Everything around you suffers from your lack of desire to do anything. When you force yourself to accomplish something, you not only start to get things done, you can look back at what you did and it might make you feel a little bit better. As mentioned earlier, one of the symptoms of depression is the loss of pleasure you feel. By trying new and interesting things, you might find a few that make you happy. Many counselors recommend someone suffering from depression try something new at least once per week. This helps alleviate the boredom that many people with depression suffer from as well as serves as a distraction. Although it might not be easy, particularly when you are depressed but healthy eating and exercise are known to help depression. When your body is healthy it is easier to combat the anxiety, unease, and hopelessness of depressive illness. Exercise also releases endorphins, which produce a feeling of euphoria. This can help with even the worst depressive episodes. Even though you do not feel like it, forcing yourself to eat healthy and exercising regularly will help with depression according to the Mayo Clinic. For more tips on living with depression, give us a call at We can help.